Morning Peeps, time for our new Allsorts challenge and this week I am your host, like many of us I love creating with the beautiful colours of this time of year so my theme is 'Autumn Glory'. Our sponsor is Lost Coast Design. So inevitably there would be more than one from me this week and two of my shares uses a new stamp from Lost Coast Designs which I recently won in their challenge, it's called Large Shrubbery and my goodness it is a big stamp. The top one has a Pan Pastel background, was stamped first with Versafine Toffee and again with Versamark so that I could heat emboss with detail copper powder...........my Timmy stamp platform is perfect for doing this. I added a sentiment and some birds, heat embossing them as well and cut into three to make a triptych card. Although I love this season I don't relish the thought that it means winter is approaching and when I saw Sue's lovely card a few days ago using the Sweet Poppy Squirrel I had to have it, it was showing as out if stock so I was thrilled when Lucy called to say it was available and half price so bonus and I ordered it along with a couple of replacement pots of paste as I'm getting low. I created a Distress Oxide background and used Copper paste to stencil the squirrel onto it, mounted it on to some coordinating card and added an Inkylicious sentiment. Next my entry for the current Butterfly Challenge and the wheel has spun round to the letter 'S' giving us Scarlet, Sea Green, Sahara Sand, Sequins, Silhouette and Spots plus of course a Butterfly. I knew instantly that Brushos would help me out and I used Scarlet, Sea Green and Sandstone which I applied to the background along with liberal helping of water. I loved how the sea green ran into the sand colour, although it does look rather orange but that's the beauty of Brushos, you never get the same twice. I then stamped a silhouette Lavinia Fairy and built up the scene with other Lavinia stamps including a little mouse, then three Chocolate Baroque silhouette Butterflies, used tiny sequins on their thorax, and finally added spots using a stencil thus completing the full compliment of the Butterfly wheel. My third card also has a Distress Oxide background and has been stamped with Versafine Toffee, a, Inkylicious sentiment and a few leaves across the top to frame the scene. And I just had to share my enthusiasm for Versafine Clair inkpads, I know they have been out a while and lots of you have already tried them but I have heard contrasting reviews so have not bought any........until this week. Chocolate Baroque Lesley mentioned recently that she was impressed with them so I though I really should try a few and when Allsorts Kath told me this week that an on line store had a one day 20% off offer I ordered myself six...............I know I could have tried just the one but wheres the fun in that. To say I am impressed is an understatement, I took a Lavinia Fairy and stamped her out in the six colours and got a super image, I actually used my Timmy stamp platform thinking I might need to stamp a couple of times, but not necessary and what you see is just one stamping. It's quite a chalky finish which I rather like and so intense......no secret I do love colour as does Lesley and why she suggested I try them. I can see now I didn't clean the stamp properly after the last couple so there's a bit of transfer onto the skirt. Happy weekend all, I hope the weather stays nice as today we are out for lunch with the Assistant Chief Constable of Hertfordshire..... aka eldest son Owen. Morning to you all, today I am sharing some card over at the Chocolate Baroque blog using stamps from the recent Hochanda TV shows which featured beautiful Eastern inspired stamps. On my shares here today I used Silhouette Palace 1, Silhouette Palace 2 masks, Indian Textiles, Natures Paisley, Indian Elephant, Natures Paisley, Useful Leaves, Seasonal Journey and June Fairy. I have written up details of how I made each one over at the CB blog. And here is my Rudolph Days share for this month challenge over at Mo's, and no surprises that it's also a Chocolate Baroque share, one of those I made using the lovely Serena which featured on Hochanda a couple of months ago. I kept it fairly simple stamping her onto Kraft with versamark and heat embossing with detail white, added some flowers and pine cone and highlighted parts of her with a white pen. Many thanks for your visits and kind comment which are always appreciated. Morning Peeps, time for our new Allsorts challenge and this week Helene would like to see creation with 'Water or the colour Blue'. 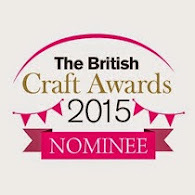 Our sponsor is Craft Obsessions offering a £15 store voucher. Had my Papworth Hospital appointment yesterday, an hour of breathing tests, x.rays and then the consultant who told me I have Pneumonitis. They think they caught it early and after another CT scan to accurately identify the areas of inflammation it should be treatable. Quite a relief as all sorts have been going round by head since it was picked up by accident on a scan for my kidneys. So onto my DT pieces for this week, for the top one I created a lakeside scene using an Inkylicious stamps I received for my Birthday (thanks Sal), the stamp is actually what you see to the left hand side of my card but I could visualise it as a larger lake. So I created a reverse image by stamping onto acetate using Versamark black, laid my piece of card over the top so the image was to the left when looking at it face on, being very careful to gently but firmly rub all over the back without letting it move. I then stamped the image directly onto the card so that the scene was extended. I coloured in with pencils and Pan Pastels, added some glossy accents and glitter to the water, stamped some birds and mounted onto a piece of corrugated. My second one is the result of watching a catch up show where John (next door) was demoing with some new Crafts Too stamp sets and being a scenic girl I had to have a couple of them. I have never ordered from Hochanda as I find their £6.99 postage excessive so was very pleased to find them on Joanna Sheen's website where I have shopped for many years, their service is great and free pps on orders over £10. I stamped the images which are a two part system roughly where I could visualise the scene, then built up around them with torn paper masks and Pan Pastels and finally glossy accents and glitter on the water. I am going to have fun making more with these stamps. Hubby thinks the images are disproportionate and the boat looks like a cruise ship sitting on the horizon but as I told him it's all subjective!! 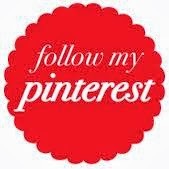 Please pop over to the challenge blog to see the inspiration from my teamies. I really didn't think I would get round to making something for the current Butterfly Challenge as I have been snowed under making samples for the next Chocolate Baroque Hochanda shows, but eventually found an hour of 'me time' to make something. The Butterfly wheel this time round has the options of Azure, Apricot, Amethyst, Button, Ribbons, Layers and of course a Butterfly and I managed all elements albeit there is only the one button and a smidgen of ribbon. I used Distress Oxides to create a background and stamped Chocolate Baroque Honeysuckle Butterfly centrally and stamped the Butterflies once more and coloured all in the sparkle pens........I find these work really well on inky backgrounds as they cover without the need to bleach out the colour. Then some random background stamping and stencilling, picked out a few of the spots and embossed with detail white powder. The quote is from my favourite CB sentiment set Words of Inspiration masked and stamped so that it could be added as three pieces and finally added the Butterflies and sentiment using foam pads to give my layers, a tiny button and bow on the large Butterflies thorax and of course wire antenna. Good morning Peeps, a really quick post as guess who forgot all about the challenge mid month posts, in fact I only remembered when I saw one of my team mates posts on my reading list. So here are my shares for Penny Black and Stamping Sensations challenges. Our theme at Stamping Sensations is 'I Spy something beginning with B' and on the top card my B's are Birds, Branches, Blue and Black. All stamps are from the lovely Bev at Bee Crafty who is our sponsor this month offering a £25 store voucher. And my second card, also with stamps from our sponsor and the 'B's on this one are Boy, Birthday, Building and Bubbles. And my Penny Black share where our theme is 'Make it Feminine'. And here's a fun one for the current Snippets Playground Challenge. I didn't think I would have time to join in but saw this in my folder and thought it would fit the bill. It's one I made for the recent Stamp Addicts Hochanda shows. I had the bottle neck hangers from years ago so just stamped the sentiment onto offcuts, cut with TL dies and mounted onto the front of the hanger and added some ribbon. When I sent this one off to Sarah, I said I wasn't sending the bottle as knowing she is partial to a drop of red, I was sure she had one or two she could use and sure enough she confirmed that on the show!! You can find the stamp here. Morning Peeps, apologies for the no show for a few days round your blogs, had a bit of a kidney flare up so not felt my best this week. It's time for our new Allsorts challenge and this week Ellie would like us to create a scene with stamps and/or dies. 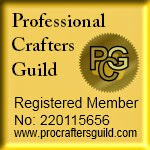 Our sponsor offering a £15 store voucher is Swedish House Crafts. I also have my shares from today's 15 minute CAS post over at Chocolate Baroque blog. So, a lolly stick creation for Allsorts. I had seen a few of them popping up in blogland and was rather taken with something different and wondered how many lollies people must be eating to gather together enough to make the base...................then the penny dropped as a well known kitchenware store from the Lake District..............you know the one I mean..........sells them in packs, so mystery solved, if indeed it really was a mystery rather than me needing to putting my thinking cap on. And it was rather fun. I bought what they described as 'jumbo' sticks and fixing nine together plus two more on the back to hold it all in place I ended up with a 160cm square base to play with. When the glue on the back was dry - I used Collall all purpose which is new to me but I am finding it quite easy to work with, I gave it a coat of white gesso, dried and then covered with Distress Oxides. Next I stamped Lavinia Trees and Fairies, Inkylicious leaves across the top, grounded the Fairies and trees with distress ink and used Liquid Pearls to create some flowers. Be warned, there are one or two more in production. And a second one, a scene with a mixture of stamps from Sutter, Bee Crafty, Inkylicious and Art Impressions, all stamped in black archival and then the background added with Pan Pastels and Distress Inks, some glitter and Liquid Pearl berries. And now for my Chocolate Baroque shares. Hello Peeps, today it's my turn again to post over at the Chocolate Baroque blog with more of my samples from the recent Hochanda TV shows using the beautiful Eastern inspired stamps and for simplicity I have just lifted my post from there. The Elephant shaped card above was cut from a mask I purchased a long while ago to make cards for our youngest Granddaughter who loves anything related to Elephants, she treasures a small pink Elephant she had as a baby named Ellie.......it must be the most travelled Elephant ever as it goes everywhere with her. I stenciled the background with Silhouette Palace 1, stamped the Elephant from Indian Elephant and coloured in with pencils, then stamped using Distress Markers direct to stamp flowers from Indian Elephant and Indian Textiles, cut them out and fixed across the top of the Elephant and added some peral strings. Here I have used the large Elephant from Paisley Elephant which I stamped and then masked so I could stamp the background with the script stamp from the same stamp set. After removing the mask I coloured the image with sparkle pens and randomly stamped around the edges with Natures Paisley. Finally I added some gold lace to the bottom, gold pearls to the Elephant and mounted into corrugated to which I had added some gold embossing. I have to confess to really linking the Palace on the Indian Textiles stamp set, this time I used Versafine Toffee and stamped onto cream card which I first stamped with the script from Natures Paisley and added some stenciling using Silhouette Palce 1 using a sponge from which I dabbed off most of the the ink to achieve a soft finish. Then I used the edge of the border stamp from Indian Textiles across the top. Morning Peeps, time for our new Allsorts challenge and this week Kath would like to see Bears and we have a lovely stamp from Penny Black for this weeks prize...........I couldn't believe that I didn't have a single bear in the PB box so it's some little critters which are always popular. I feel I need to offer an explanation for any dodgy comments you might have received from me recently. My dexterity is always bad as is my sight, all part of the MS scenario so what I write is not always as intended, but I am reliant on one eye at present until the cataract is dealt with so between iffy fingers and sight I know there have been a few faux par's slipping through the net. Back to my card which is something right out of my comfort zone and the theme did put me in a bit of a quandry. I thought I had a Polar Bear stamp but it's not to be found anywhere, then in my search I came across a Penny Black set hidden in a bag marked just Penny Black, no name or code and I am sure I would never have bought it, so can only conclude it was one I was asked to use in a class or for store samples at some point. Anyhow, it fitted the theme perfectly and I used two of the stamps in the bag to create a little scene, extending the stamping from around the tree to add a few more flowers. Pan Pastels for the sky and background along with DI's and pencils for the colouring and red gem 'apples' on the tree. Please do pop over to the challenge blog to see the inspiration from my team mates. 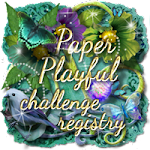 It's time for our new challenges at Stamping Sensations and Penny Black and More where our themes are 'I spy' and 'Make it Feminine'. As always there are wonderful prizes to be won at both. And I had to share some photos of Clover an adorable Dalmatian puppy that has joined our family, you will find her further down my post. Starting off with my PB&M share at the top I used an old favourite Venetian Summer which I stamped with black Versafine onto Fabriano, next I stamped the Roses from Red Blush around the top and sides to frame the Venetian scene. I then stamped, cut out and coloured more roses to decoupage and after coluring the scene I used Pan Pastels to create the sky and sun rays and matted onto a black base card. I have to say I am feeling rather deprived this year as we have not been to Venice, somthing we usually do even if only for a couple of days pre cruise. This was was so much fun, starting with Distress Oxides which I put onto a piece of acetate, spritzed with just a little water as I wanted to loosen the ink but keep the coloures vivid, then dragged a piece of Fabriano through and left to dry with no dabbing off. Next I stamped the Walking Together stamp from Bee Crafty with black versafine, cleaned the stamp and inked just the large circle element to stamp along the side and also just the bottom section of the stamp to fill in across the base. The sentiment is Chocolate Baroque. And another I made for Bee Crafty using quite a few Bee Crafty stamps, Branches, Poppy, Sentiment, Teasels and Leaves. I gave some details of how I made the base card here a while ago here so won't bore you with it again. I used Oxides to create the backgrounds, the stamped the images, added some texture paste with a stencil and bleached out the colour from the Poppy. The new Butterfly Challenge started this week and the colour palette really appealed to me and I beleive I have managed to incorporate all seven elements which are: Electric Yellow, Embossing Powder, Eucalyptus, Embellishments, Emerald, Embossing Folder and of course a Butterfly. I stamped the Penny Black flowers with black versafinre and heat embossed with detail clear powder, then coloured in with sparkle pens, one of which is actually called Emerald and the brightest yellow I had. I then cut it out and stamped the little Butterfly sitting on the stem a second time and decoupaged. The background was washed with two shades of green DI the closest I could find to the requisit colours and yellow, dried and embossed with a TL folder, fixed he flowers in place and added a bow and two little embellishments. And as promised a couple of photos of Clover, our new Great Granddog. 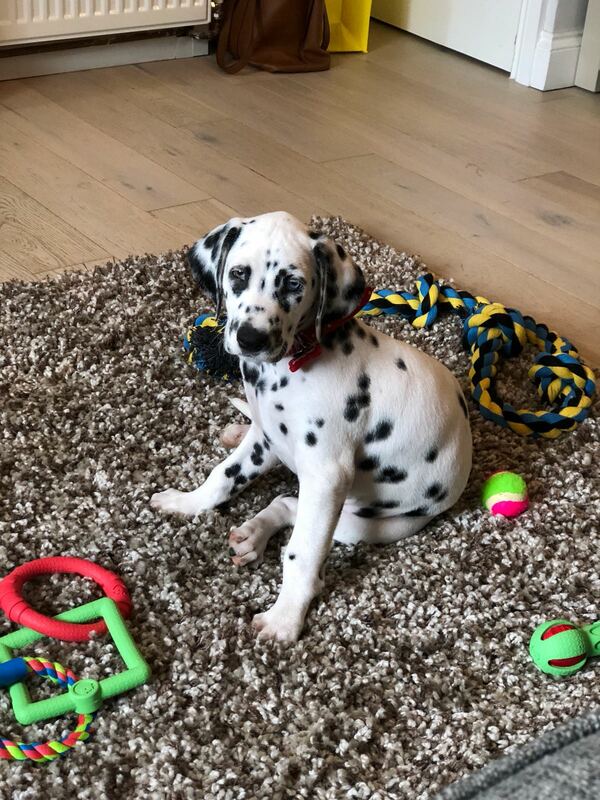 Ever since she was little Anysia has wanted a Dalmation and we knew that once she and Sam bought their first house it wouldn't be long. 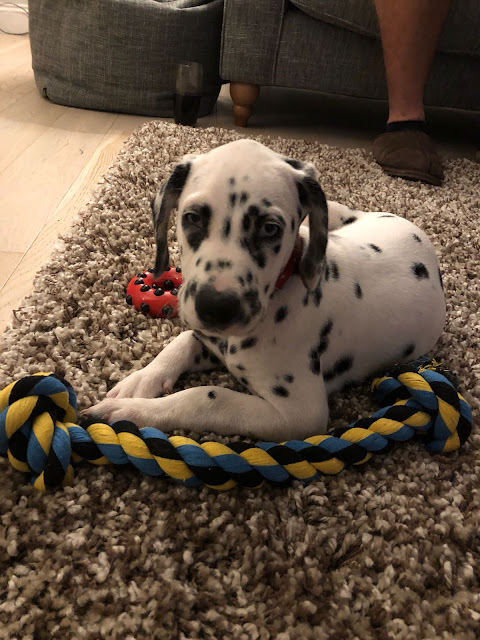 She is now nine weeks old and adorable, they have had her for a week and already she knows her name and we have had lots of puppy cuddles. I hope you will pop over to the challenge blogs and see what my team mates have created to inspire you and look forward to seeing all your creations. Those leaving a comment on any post on this blog do so in the knowledge that their name and blog link are visible to all who visit this blog and in so doing have published their own personal details. Morning Peeps, time for our new Allsorts challenge which I am hosting and the theme is 'Things with Wings', Butterflies, Bugs, Birds, Fairies, the choice is yours. 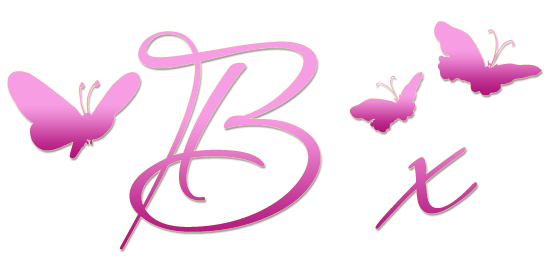 I am also posting over at the Chocolate Baroque blog today, you can find my artwork further down. Starting with a piece of Fabriano I used Pan Pastels to create a background, then I used a stencil and DI's to sponge some sun rays..............or they could be moon rays............that one is down to intrpretation! I stamped the Lavinia Fairy with black versafine, then my all time favourite stamp Stampendous P107, Agapanthus cluster as it works really well with the Lavinia image. Finally some toadstools, foliage and a little mouse all of which are Lavinia. The sentiment is a pretty old one from Stamp Addicts although I don't think it's available anmore. Here's another I found lurking in my files, it's one I made ages ago for Tattered Lace but never blogged. The Rare Earth image was stamped with versafine black and coloured in with sparkle pens, I stamped the Peacocks tail and some of the flowers a second time and decoupaged, then matted with TL pearl border frames. Today I am also posting over at the Chocolate Baroque DT blog, all details of my work can be found there but these are the stamps and stencils used which are all available on the CB web site here: Indian Elephant, Indian Textiles, Paisley Elephant, Natures Paisley, Amazing Mackintosh Words Silhouette Palace 1 and Silhouette Palace 2 on the card above and the little acetate book below. Indian Elephant, Indian Textiles, Paisley Elephant, Natures Paisley, Amazing Mackintosh Words Silhouette Palace 1 and Silhouette Palace 2.